As banks and global analysts try to parse the Dubai debt problem by examining who owes what to whom, the most likely candidate to bailout the Arab emirate, its wealthy neighbor Abu Dhabi, has said it may help on a case-by-case basis. In an exclusive interview with Reuters, a government official in Abu Dhabi said the UAE capital will "pick and choose" how to assist its debt-laden neighbor Dubai. That means that the exposure some large global banks have may not be part of any assistance package from other Arab neighbors, and that potential problems with write-offs may still exist. The markets have played down the Dubai credit crisis by saying that it is relatively minor. Dubai's "standstill" on payments from a pool of debt that totals $60 billion is modest compared to the size of worldwide bank loses over the past five quarters. But, some banks in Europe still face balance sheet problems if Dubai officially defaults. The worry over Dubai has cascaded into concern about shaky debt in other markets. The Wall Street Journal reported the cost to insure debt from Bulgaria and Hungary moved up sharply on November 27. 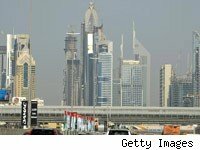 Dubai has set of a round of "risk guessing" about problems with other sovereign debt and also with huge pools of troubled assets such as commercial real estate. The markets don't like guessing games, so they are likely to remain nervous, perhaps for weeks.